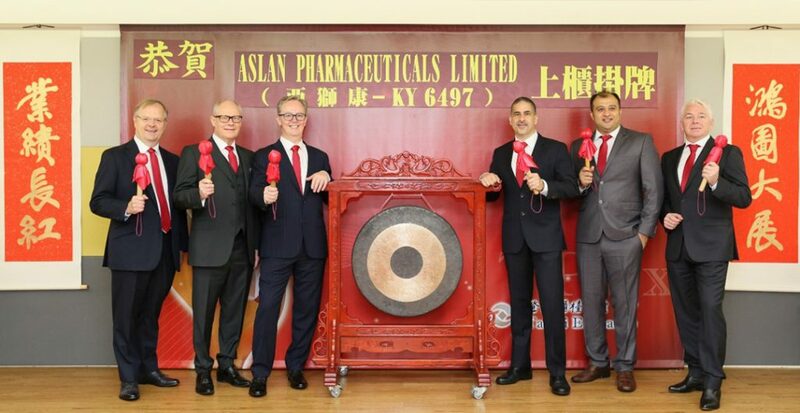 ASLAN Pharmaceuticals starts trading on Taipei Exchange today. ASLAN is the first foreign biotech company to be listed on the TPEx. Dr Carl Firth (third from right), CEO and Founder of ASLAN, and his senior management team at ASLAN’s listing ceremony at the stock exchange in Taiwan this morning. ASLAN Pharmaceuticals (ASLAN; 6497.TT), a biotech company focused on the development of immunotherapies and targeted agents for Asia prevalent tumour types, is pleased to announce the admission today of its ordinary shares to trading on the Taipei Exchange. ASLAN has raised a total of NT$1 billion (US$33 million) from the initial public offering.